Field trips are a critical and integral component of geoscience education. They provide students with unequaled opportunities for exploring and understanding geological principles first-hand, outside of the classroom, at real-world scales. Such trips, however, are expensive endeavors. While students themselves bear a portion of the costs, we rely on grants and donations to cover the majority of the trip's costs. This helps to ensure an affordable experience open to all students. Our Florida field trip is being funded by a generous anonymous donor, Shell, Chevron/Texaco, and various individual contributors to the Department of Earth and Environmental Sciences' Field Excursion Endowment Fund. If you are interested in helping support future field trips, please visit the Department of Earth and Environmental Sciences' Giving Opportunities page and consider donating to our Field Excursion Fund. 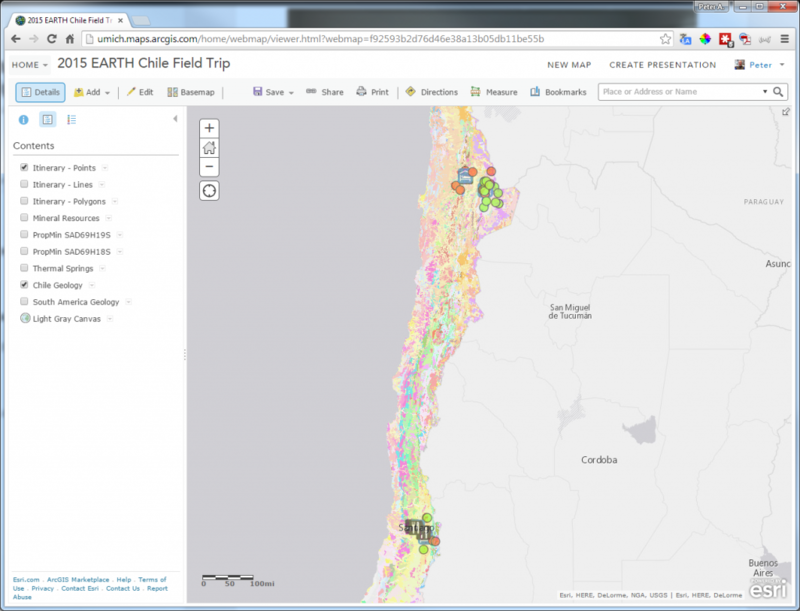 It’s time for another University of Michigan, Department of Earth and Environmental Sciences, geology field trip, and this time we are headed south… far south… to Chile! The geology of Chile covers a broad swath of Earth history and exhibits a wide range of interesting features. During our trip — 26 February to 8 March 2015 — we will only be able to cover a small subset of what Chile has to offer. Our planned itinerary concentrates on geology and mining in four areas: San Pedro de Atacama, Calama, Cajón del Maipo, and Santiago. The enthusiasm and excitement shows at the final meeting of EARTH 435 before the field trip! In addition to geologic topics, many presentations also touched briefly on archaeology, anthropology, economics, history, etc., in order to provide additional context for the places and people we will be visiting. Thanks to funding from a generous anonymous donor, Shell, Chevron, and various individual contributors to the Department of Earth and Environmental Sciences Field Excursion Endowment Fund, the out-of-pocket cost to students for this trip has been greatly reduced, ensuring an important educational experience is available to all. glad to see my money being put to good use!